NASA has got some very high quality photos of the fifth planet from sun, Jupiter. As NASA's Juno probe just passed closer to Jupiter than any human-made craft ever. It looks pretty huge in the photos. It’s 2.5 times the mass of all other planets in the solar system combined and it's so huge, in fact, that it doesn't actually orbit the sun. Actually, it's big enough that the center of gravity between Jupiter and the sun doesn't actually reside inside the sun rather, at a point in space just above the sun's surface. As Earth orbiting the much-larger sun and we are very much familiar with this situation. The center of gravity resides so close to the center of the larger object that the impact of this phenomenon is negligible. The bigger object doesn't really move and the smaller one starts orbiting around it. But when a small object orbits a big object in space, the less massive one doesn't really travel in a perfect circle around the larger one. In fact, both objects orbit a combined center of gravity. To elaborate this situation more clearly we’ll take the example of ISS. When the International Space Station (ISS) orbits the Earth, both the Earth and the space station orbit around their combined center of gravity. But that center of gravity is so ridiculously close to the center of the Earth that the planet's motion around the point is impossible to spot, and the ISS made a near-perfect circle around the whole planet. Same thing happens when most of the planets orbit the sun. Both the sun and the Jupiter orbit around a specific point. 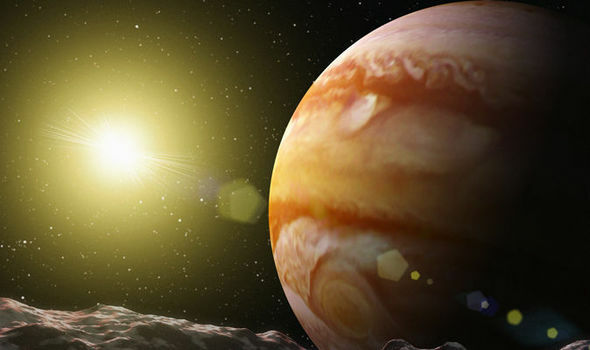 The gas giant is so big that its center of mass with the sun, actually lies 7% of a sun-radius above the sun's surface. If we just see the sizes of both, Jupiter is still only a fraction of the sun's size. That is, in essence, how Jupiter and the sun move through space together. But this is an interesting thing to say that Jupiter is so massive, it doesn't orbit the sun.